A Cal Fire firefighter monitors a burning home on November 9 as the Camp Fire moves through Magalia, California. From record-breaking wildfires in California to a super-typhoon in the Philippines, from drought in New Mexico to flash floods in Nigeria, extreme weather disasters are wreaking havoc around the world. 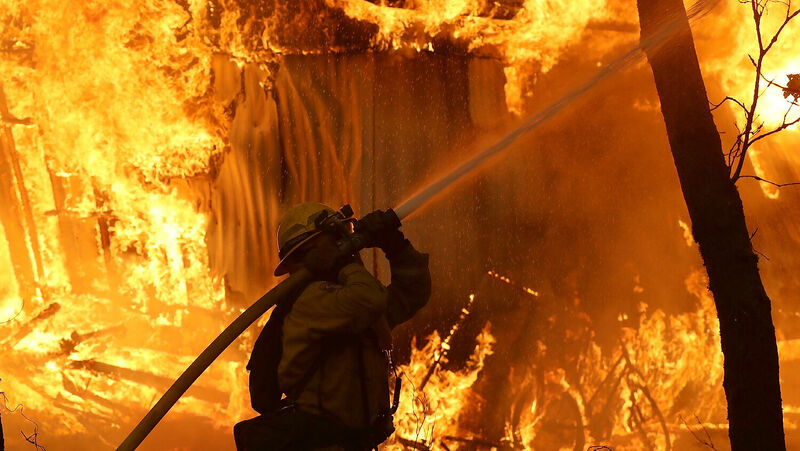 A report released by the United States Global Change Research Program on November 23 blames such extreme weather disasters on man-made global warming caused by burning fossil fuels. While the report stops short of listing a specific target for greenhouse gas emission reduction, a United Nations report published on October 8 states that the world needs to cut greenhouse gas emissions by 40 percent over the next 12 years to avert a catastrophe. Unless a cost-efficient, clean energy source is suddenly discovered and developed, such drastic cuts in greenhouse gas emissions would devastate the economies of the U.S. and other Western nations. The reason the U.S., Britain and continental Europe have made major strides in reducing greenhouse gas emissions at home is that they have been outsourcing carbon dioxide generating activities overseas by importing steel, cement and other goods from factories in China. It is undeniable that Western efforts to slash greenhouse gas emissions have tremendously benefited China’s economy. A number of scientific papers show that the conclusions drawn in both the U.S. report and the UN report are based on biased science. Government-funded climate scientists have narrowly focused on the insulating effect that carbon dioxide in the atmosphere has on the Earth. But their computer models omit factors such as increased plant growth. These scientists also fail to admit that it is impossible to attribute individual storms to global warming due to the fact that physical processes in the atmosphere are still poorly understood. Here at the Trumpet, we are concerned about how extreme weather disasters fulfill Bible prophecy. The oldest book in the Bible, the book of Job, states that God is the one who balances the vapors of the clouds and warms the Earth with a south wind (Job 37:16-17). He commands the clouds do His will, whether for mercy or for correction (verses 12-13). The Heartland report goes on to explain how computer simulations are the primary tool climate scientists use to make predictions. Yet these computer models fail to accurately predict climate change because they oversimplify the Earth’s climate system. For example, they ignore the basic fact that the heating effects of carbon dioxide are not linear. The first 20 parts per million of carbon dioxide in the atmosphere produces more warming than the next 400 parts per million. This means that carbon dioxide has already warmed the atmosphere almost as much as it can. These simulations also ignore many of the Earth’s climate systems that mitigate rising carbon dioxide levels, such as increased plant growth. As atmospheric carbon dioxide levels rise, plant growth increases. As plant growth increases, atmospheric carbon dioxide levels fall. This mechanism helps keep the Earth’s atmosphere balanced. Since most computer simulations ignore feedback loops such as plant growth, they exaggerate the effects of rising carbon dioxide levels to apocalyptic levels. The Heartland report also notes that because physical processes in the atmosphere are not well understood, scientists make guesses about the values of the variables in the equations they use to predict storms. This is why weather predictions made more than two weeks in advance are often hopelessly inaccurate. It is also why climate scientists cannot decide whether warmer ocean surface temperatures increase or decrease hurricane frequency. The burning of fossil fuels may have some limited effect on global temperatures, but the problem with the government report is that it systematically ignores the mechanisms that God designed to bring the Earth’s atmosphere back to equilibrium, and it makes unproven claims about the link between temperature and weather disasters. Much of these factors are basic science, yet the study’s authors ignore them because they have other motivations. Several chapters in the book of Job cover God’s explanations of how the atmospheric mechanisms that control the Earth’s climate are under His control. They are vast and complicated, beyond human comprehension. “God thundereth marvellously with his voice; great things doeth he, which we cannot comprehend. For he saith to the snow, Be thou on the earth; likewise to the small rain, and to the great rain of his strength. He sealeth up the hand of every man; that all men may know his work. Then the beasts go into dens, and remain in their places. Out of the south cometh the whirlwind: and cold out of the north. By the breath of God frost is given: and the breadth of the waters is straitened” (Job 37:5-10). Centuries later, God told King Solomon that weather disasters are actually tools in His hand to punish people for their sins, and to alert them of their need to repent. “If I shut up heaven that there be no rain, or if I command the locusts to devour the land, or if I send pestilence among my people; If my people, which are called by my name, shall humble themselves, and pray, and seek my face, and turn from their wicked ways; then will I hear from heaven, and will forgive their sin, and will heal their land” (2 Chronicles 7:13-14).